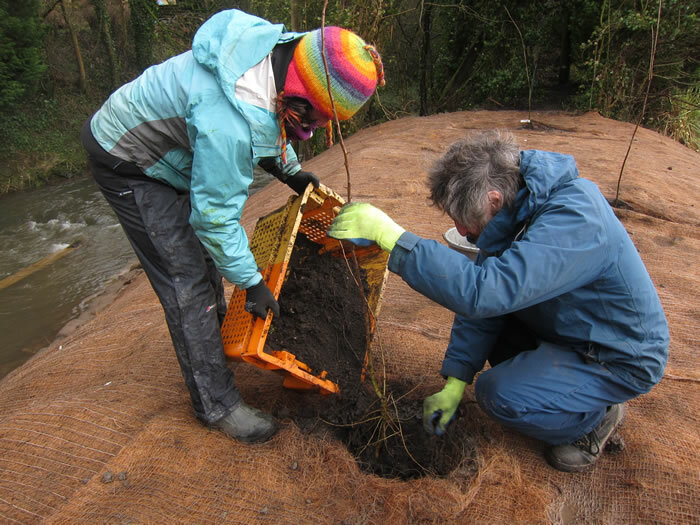 Having been snowed off the February working parties, volunteers finally got going in March planting over 70 trees and shrubs on the area that had been disturbed where the new feed had been built. It’s still looking pretty bare there but will gradually fill again. We also plan to sprinkle wildlife friendly wild flower seed here. The next task was to install a new wonderful (and extremely heavy!) 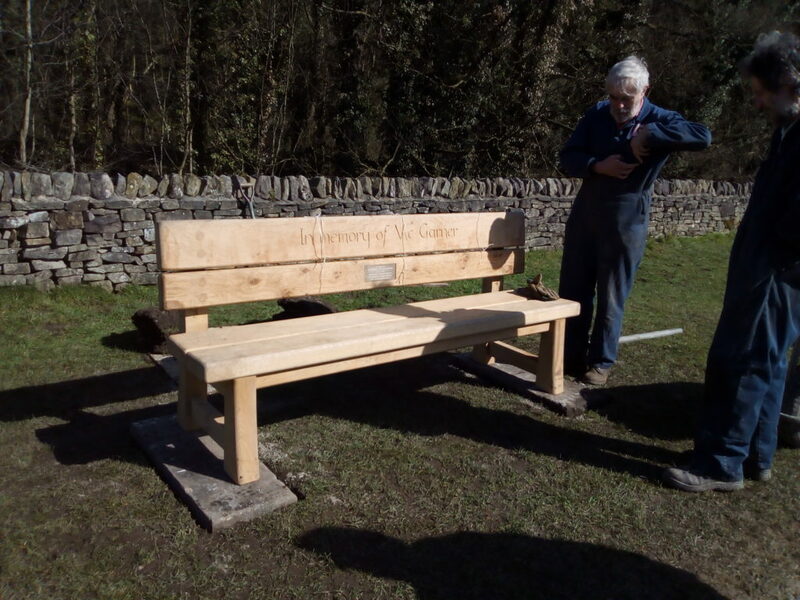 bench in memory of Vic Garner who’s analysis of sediment in the basin ensured that the restoration could go forward. This involved setting stones into the ground and bolting the bench into them. The bench looks great, made from green oak to a very sturdy design. Already well used this should enhance the basin for many years to come. Holes regularly appear in the ground immediately behind the coping stones in the lower basin area. 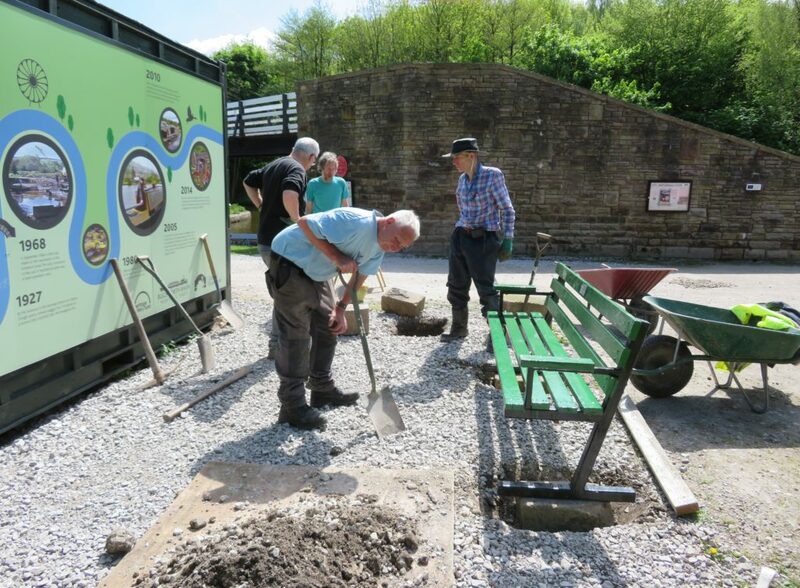 The basin being sited on infilled land built behind the large riverside retaining wall, holes are always of a concern for water loss, destabilisation of the ground and are also a hazard to walkers. 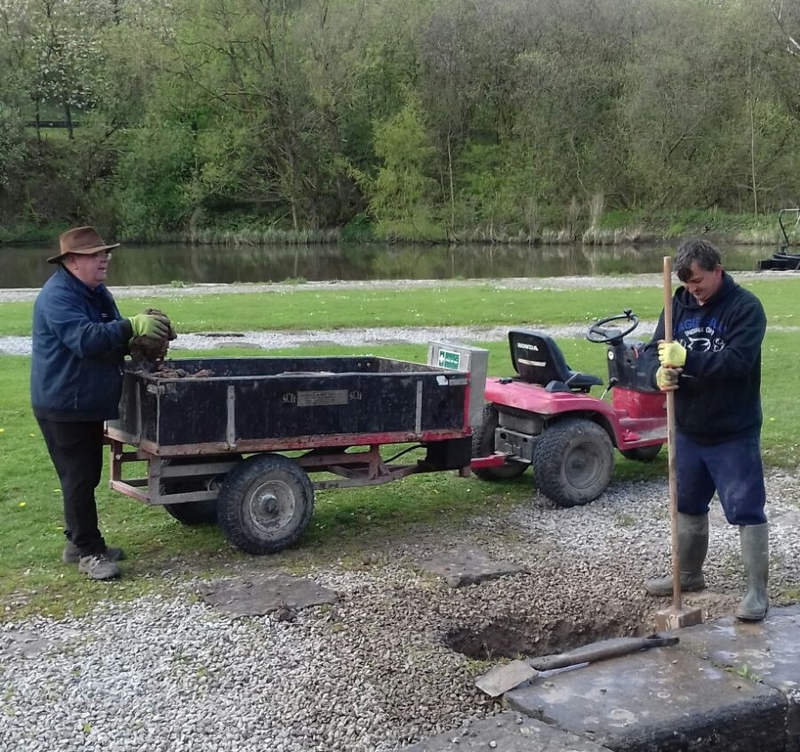 Pablo and Rod have been busy clearing then plugging the many holes around the lower basin arms with puddle clay. 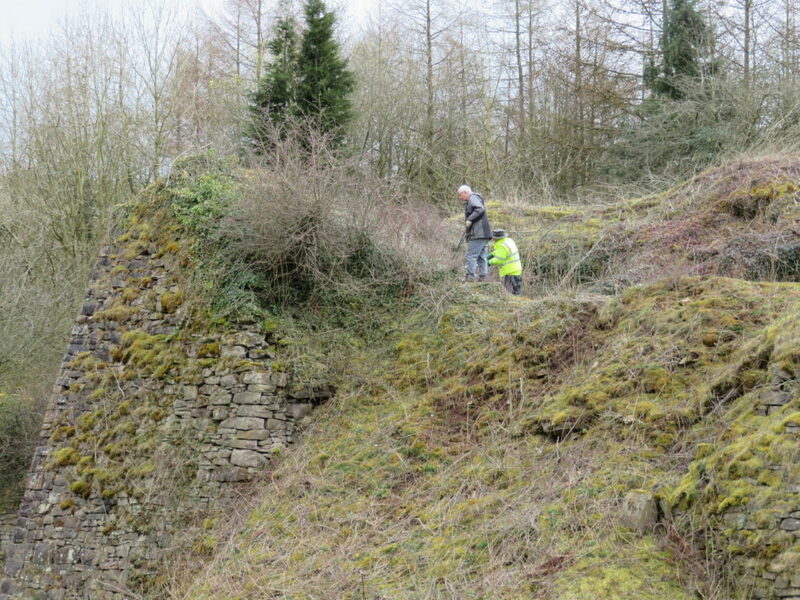 Keeping the lime kilns clear of trees to prevent roots damaging the structures is a never ending job which Martin spends many hours doing, seen here with Steve helping. The major job has been the assembly of the replica tramway wagon. After much deliberation it was finally decided to have the steel cut in ‘kit’ form for the body of the waggon. This has been assembled in the workshop and is now ready to be moved onto rails on the island, which is due to happen shortly. The gate remains to be made by a local blacksmith and will be attached to the end of the waggon at a later date. 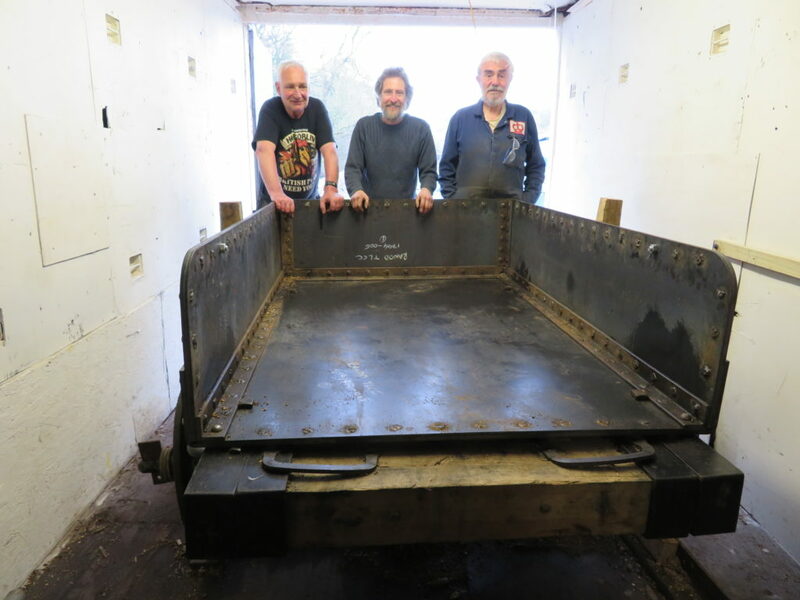 The wagon will be left to rust for a year after which it will be treated and painted black and filled with limestone. In the area between the shop and the containers a group from Alderbrook who come down to the basin every Monday to work have been busy painting the planters and posts close to the shop. And outside the container volunteers have been getting stones in place for benches to be installed in the new sitting area. The idea is that visitors can sit with a drink or ice-cream while reading the time line. 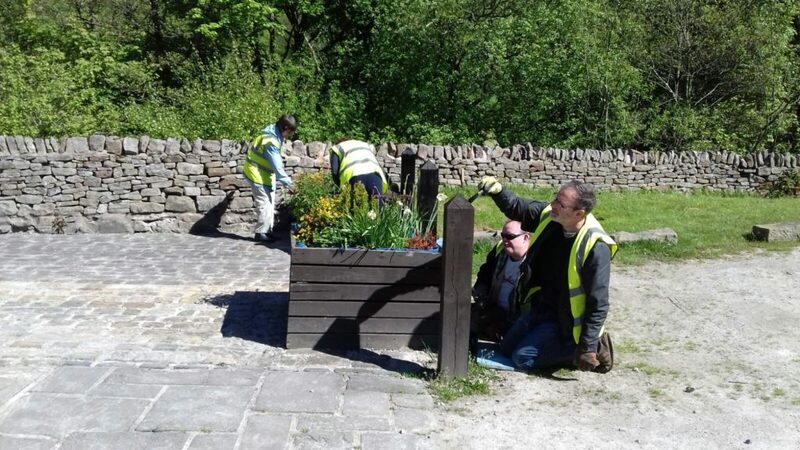 We will be putting in temporary benches while the oak ones are being constructed by the volunteers along with planters which we will be filled with herbs and flowers. Last but not least we are very pleased to have a new wildlife volunteer who is currently busy spotting and building a list of the birds, mammals and amphibians around the basin, she is also in contact with a lady who surveys for butterflies in the area so we should soon have a list of these too. 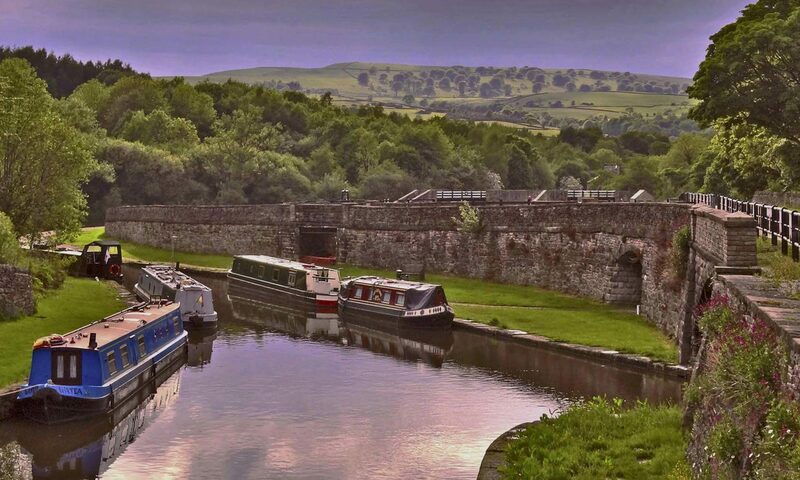 A wildlife display is planned for the information container with the idea of getting visitors to the basin involved in wildlife spotting.